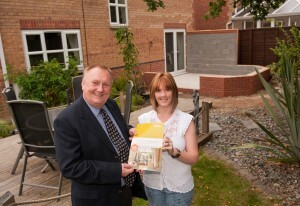 Derby woman Mrs Colette Ratliff will be enjoying the last of the summer sunshine in style after winning a conservatory worth £20,000 in a recent competition by Anglian Home Improvements. The leading home improvements company offered the chance to win a conservatory in a national newspaper competition in June. Entrants were invited to explain in less than 150 words how the conservatory would enhance their home and send in a photograph of where they would plan for the conservatory to go. Adding a conservatory to a home not only creates a bright living space to use all year round but also adds significant value to a property and Anglian Home Improvements ensures that each of its conservatories are tailored to meet individual requirements.